Size of Male: 35-40 lbs., 18-19 in. For a breed that used to be associated with the common peasantry, the Soft Coated Wheaten Terrier is quick to draw attention to the silky feel of their wavy coat. This is definitely the choice for individuals who take pleasure in stroking and cuddling their dogs. This dog breed dates back several centuries and is believed to have sprung from the Kerry Blue Terrier. The dogs conventionally serviced farms and hunted vermin, and documents reveal that the Soft Coated Wheaten Terriers also became gun dogs in the later years. It took a while for these poor man's pooches to enter the show ring. In fact, it wasn't until the late 1930s that they were recognized as a breed by Ireland, the dog's place of origin. Though the Wheaten Terrier's popularity remains modest, there's no denying that you'll find in the dog a faithful companion and a highly affectionate friend. 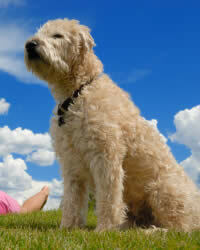 The Soft Coated Wheaten Terrier behaves like a puppy through and through. Brace to receive loads of loving from this breed! The dogs are pleasant to touch, but they will probably amaze you more with their tireless energy in welcoming you home. Born with a jolly disposition, the pooches are friendly to humans and pets alike – with the small exception of same-gender canines. Most will suffer from canine separation anxiety if human attention is inadequate. Living Environment - Secure fencing in a cool environment is a necessity for this rambunctious breed. Leave your yard unsecured and there's bound to be plenty of commotion from the dog's chasing and hunting antics. Surprisingly, the Wheaten Terrier can adjust to condominium life quite well – so long as you provide them with enough exercise. Sensitivity to warm temperatures makes this dog breed a certified indoor pooch. Grooming - This dog breed is not for the busy pet owner. Be warned that this shaggy dog is not the cleanest to behold. The dog's beard easily catches water and food during feedings, so grooming care is often above average. You must be able to devote sufficient time and attention for the pooch. Even though the breed is not a shedder, brushing every other day is necessary to prevent the hair from matting. Clipping must be done at least every month. Diet & Exercise - The dog's propensity for renal complications necessitates a low-volume but high-quality protein diet. Fish is a popular choice. Go easy on lamb and chicken as these may cause allergies. Also remember that wheat products are a no-no for the breed! Access to fresh water will ensure that the dog will urinate regularly and thus minimize kidney issues. Without a doubt, you must delegate an hour of exercise each day for the breed. They enjoy vigorous chasing games and hunting adventures. Alternately, you may take the pooch out for a walk or jog. Fat terriers can reduce weight if allowed to exercise 15 minutes more than their usual play time. Health - There are 2 top health concerns linked to the breed: protein-losing diseases which can originate in the guts (enteropathy) or in the kidneys (nephropathy), and renal dysplasia, which involves the formation and growth of cysts on the kidneys. Some dog allergies and heart problems may also surface, thus vigilant monitoring is a must. Training the friendly and intelligent Soft Coated Wheaten Terrier is more complicated than you think. The dog can be stubborn, but its sensitivity to harsh words compounds the dog training procedure. The pooch's chasing and hunting instincts also make it vulnerable to distractions. You must start basic dog obedience training early to set the proper foundation.